In this post, we will focus on the movement of the S&P/TSX Composite Index during the last 6 months (October 4, 2010 through April 1, 2011). The time line for the charts is the same but it is interesting to see the variation in the way the data are plotted based on the chart chosen. OHLC stands for Open, High, Low, and Close. This chart consists of a series of vertical lines that represent data points for the open, high, low, and close prices of the trading day. The vertical line represents the high and low for the trading day. The trading range is the difference between the high and the low price for the day. The open price for that day is shown by the dash located on the left side of the vertical line. Similarly, the close price is shown by the dash located on the right side of the vertical line. Sometimes, bar charts are color-coded. If the left dash (open price) is lower than the right dash (close price), then the vertical line will be in black to signify an uptrend for the stock; on the other hand, if the dash on the right side (close price) is lower than the dash on the left side (open price), then the vertical line will be in red to indicate the downtrend. The line chart shows only the closing prices over a set time frame (6 months in the chart below). The line chart is built by connecting the closing prices over the period in question but it does not offer any other data such as the high, low, or open prices. Nonetheless, the line chart is a useful tool since the closing price is often treated as the most significant price among the four. The candlestick chart is similar to a bar chart (OHLC) but it varies in the visual representation. The candlestick chart also consists of a vertical line showing the day’s trading range (i.e., high price – low price). The variation (between OHLC and Candlestick) lies in the presence of a wide bar on the vertical line, which signifies the difference between the open and close prices. Candlestick charts also employ colors to visually describe the day’s price movements. However, due to the lack of a universal standard, it is essential to know the candlestick color patterns employed by the website you are referring to. Usually, if the stock was on an uptrend and closes above the open price, then the candlestick will be white or clear. If the stock was on a downward trend for the day, then the candlestick will be red, black, or blue. Mountain charts are another basic representation as they simply link the closing prices of the time period and shade the area below them. They are virtually an extension of line charts. There are other types like point and figure charts and volume charts; please refer to the links for further reading. Do you use stock charts? What is your preferred chart type? Are there more types? Nice post, Clarke. Very useful information for folks. One small correction — although commonly described as a “bar chart”, your first chart is, technically, not a bar chart. It is actually officially known as an “open-high-low-close chart” or, for short, an OHLC chart. I mention this not to be pedantic (I don’t really care what we call them), but rather because people looking for more information on those types of charts will likely have more success googling for “OHLC chart” than “bar chart”. Frequently OHLC charts are combined with traditional bar charts on the same chart, as in this example. Ahhh, ignore my post. I read it quickly, and see that you did, indeed, refer to it as an OHLC chart. My apologies. Neat write up. Might be a good follow up to explain what the benifits are of looking at different types of charts. Seems like almost anyone who trades using technical analysis using candle stick charting. Typically when I’ll looking at charts I use the line chart. Probably because I don’t trade day by day, I tend to only look at the stocks over longer periods, ie. months and years. Now, I wouldn’t even consider myself a rookie when it comes to trading stocks, so I do have a question; I always see the bar chart showing trading volume below the stock price, but how should that affect my decision when looking to purchase a stock? @Mike, volume is typically used with technical analysis to confirm the direction of a stock. For example, if a stock is in a trading range for along period of time (months), and suddenly closes higher than the high of the range,it could be considered a “breakout” if the volume is higher than average as well. It’s not exact, but traders regularly use volume as an indicator. @Mike: FrugalTrader answered it for you and I’ve got at least a couple of posts on chart patterns coming up that talk about the role of volume. Neat post, thanks for sharing Clark. Thanks to all with the nice words! Useful information, although I would be curious to hear your thoughts on the validity of technical analysis. There are some strong opinions on both sides. It’s nice to see a good overview of these basics. 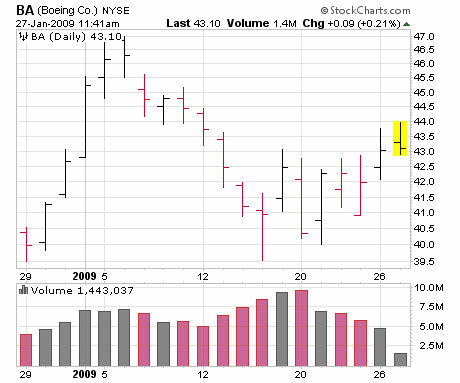 I must confess that I find it hard to look at OHLC and candlestick charts myself. My eyes are used to looking at charts to get the big picture and I find those charts have so much detail it is like a contradiction to my mind to process it all. I’m sure it’s like anything though, it would become second nature with a little bit of practice. Previous post: Financial Advice or Financial Quackery?